Today, I am honored to share my space with author, Tam Hodge. 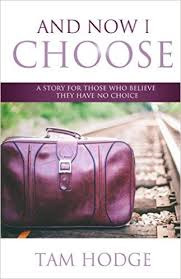 Her book, "And Now I Choose: a story for those who believe they have no choice," is the story of how she found hope and healing after suffering abuse, homelessness and multiple abortions. Tam has graciously offered a free copy of her book to one of my readers. Please leave a comment. Recipient will be randomly selected and notified by email. I hope Tam's story touches your heart as it has touched mine. xo. EE. It’s 28 years, almost to the day, from where you are sitting right now. I see you there. I see you in your white paper gown that you’ve struggled with all afternoon, trying to prevent it from opening and exposing your bare self. I see you sitting there, even in the gown, still bare. You are going to wake up soon and you will be in a tremendous amount of pain. You will physically hurt. You will hurt a lot. Oh, how I wish you could hear my voice right now. Because the physical pain will pale in comparison to the heart and emotional pain you will carry with you. You can’t see it now, but your life is going to get better. Though the memory of that day will never, ever, go away. You’re going to relive the day you spent in that white gown. You’re going to relive it often. It will always be a part of who you are. I will be here waiting for you, and you will soon see that forgiveness and redemption will hold your heart and you won’t be alone any longer. You will find that one day, the choice that you are making now, will somehow help another young girl not make the same decision. And though that doesn’t make what you’re about to do right, it will at least give those little ones a beautiful legacy. Tam Hodge is a writer and speaker. You can find her online at www.tamhodge.com and on Facebook. She lives in Franklin, TN with her husband and their two children. Tam says: "If I could share one thing with everyone I meet it's that we don't have to live under the pain and regret of our life's choices and hurts. We can let them grow us into something powerful that God can use to help others." Thank you, Tam, for sharing your love and light with us.